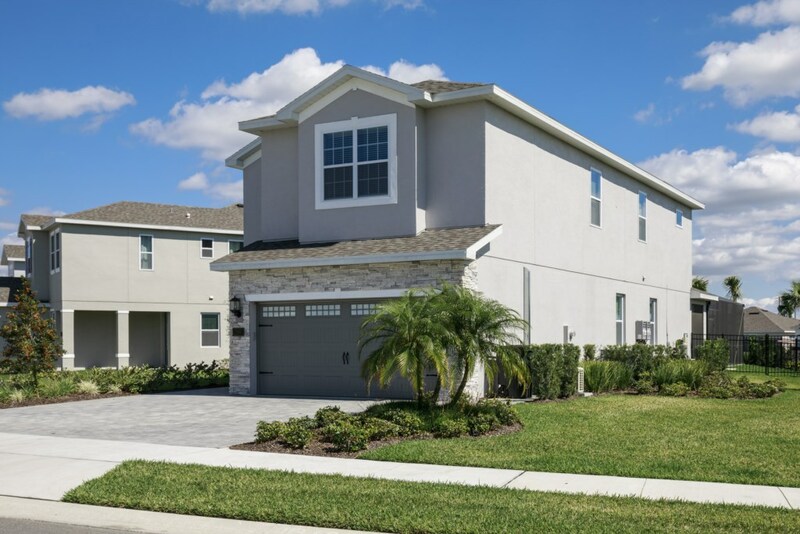 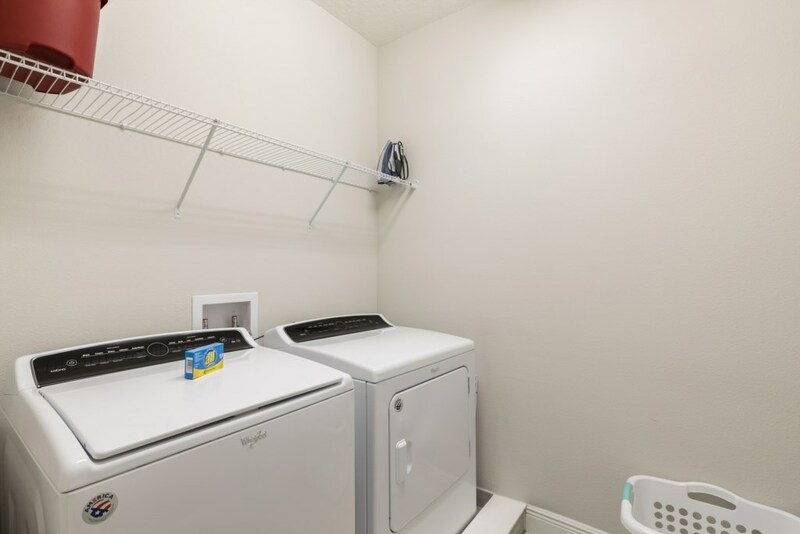 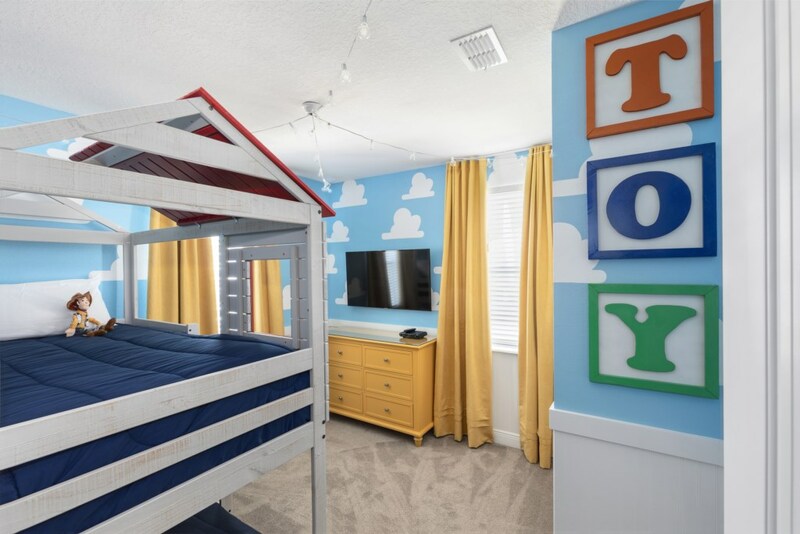 If you’re looking for a superb, 6 bedroom vacation rental in Florida that’s close to all the theme park fun, then City Loft is where it’s at. 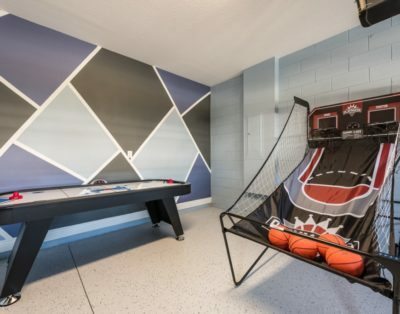 Situated right in the heart of Orlando, within the exclusive Encore Club at Reunion it comes with fantastic amenities for all the family, including a resort style pool with thrilling water slides and splash park, tennis courts, as well as a restaurant and bar area. 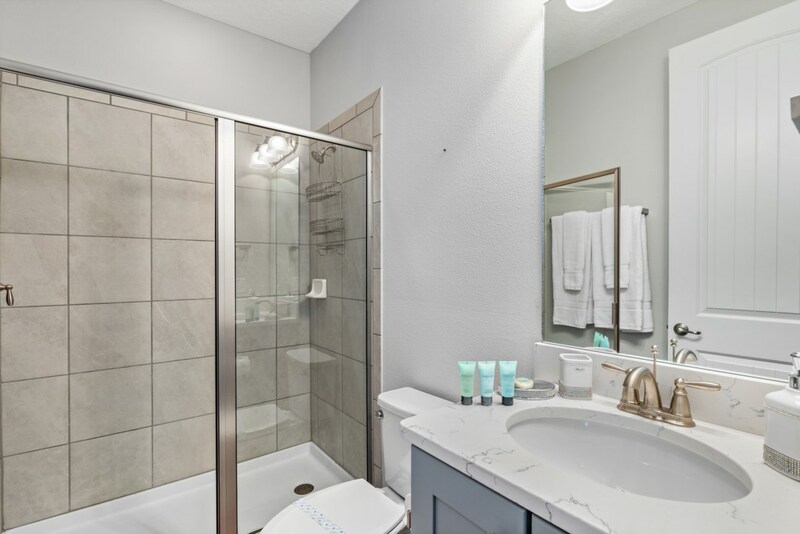 It’s is only a ten minute drive from Walt Disney World, but you can also jump onboard one of the daily, complimentary shuttles too. 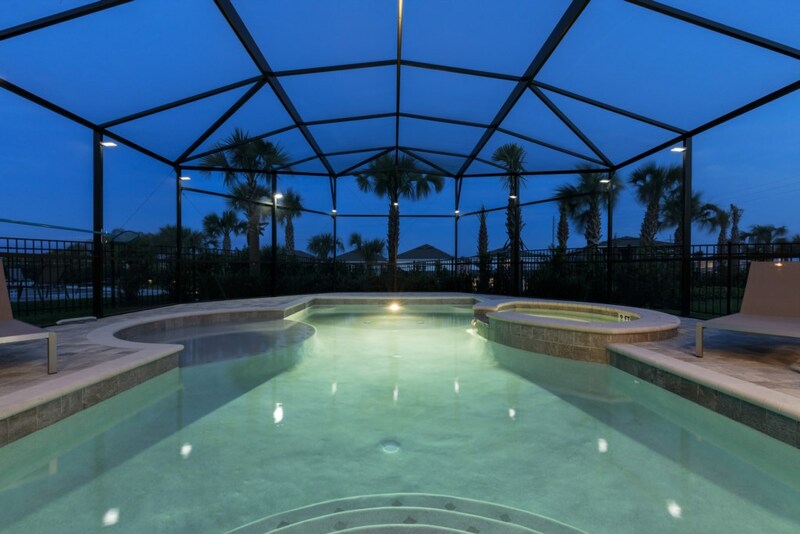 This detached, luxury vacation home comes with a screened-in, outdoor pool, perfect for swimming laps and also with a luxury spillover spa. 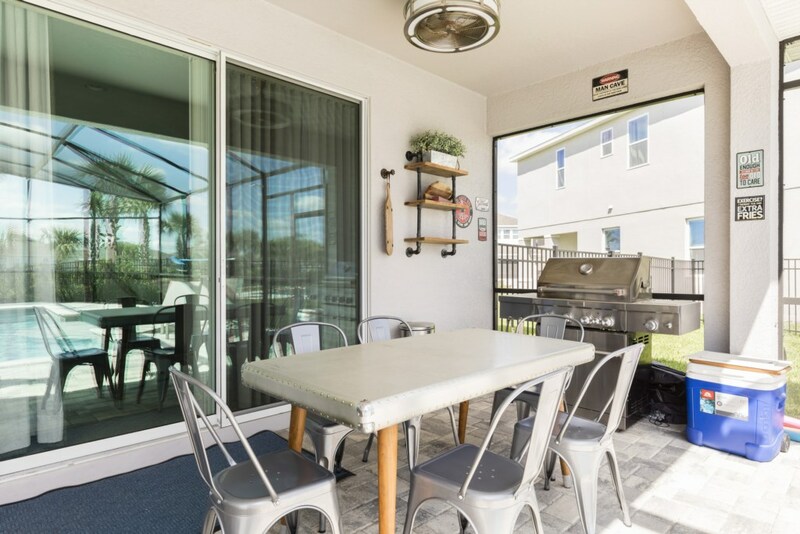 The rear of the property has been designed with a purpose built, shady lanai, dubbed the ‘Man Cave’, which plays host to an industrial chic table and chairs and a BBQ grill. 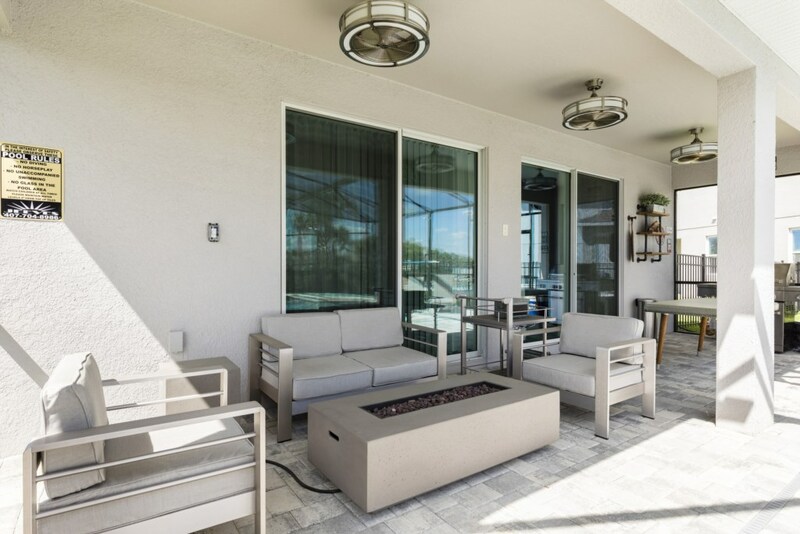 This outdoor dining area overlooks tropical palms and the shimmering pool. 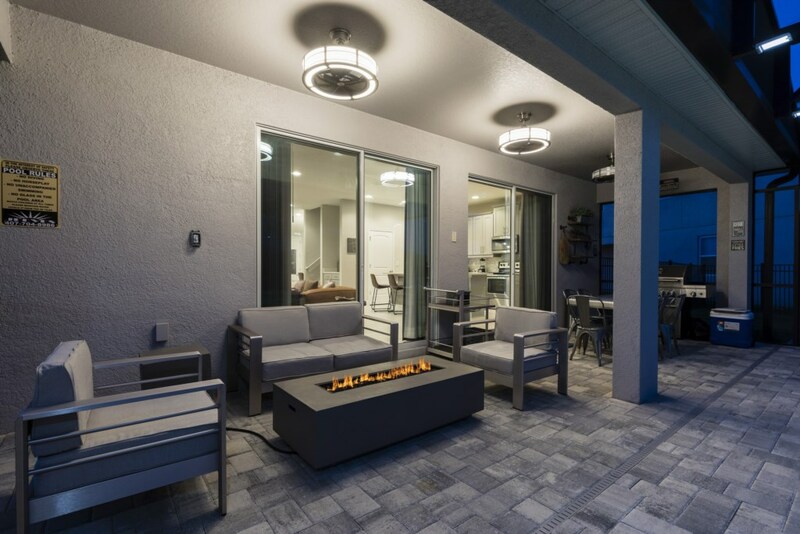 This, alongside the four sun loungers, patio chairs and outdoor sofa with fire-pit, means that life in the sun is fine at City Loft! 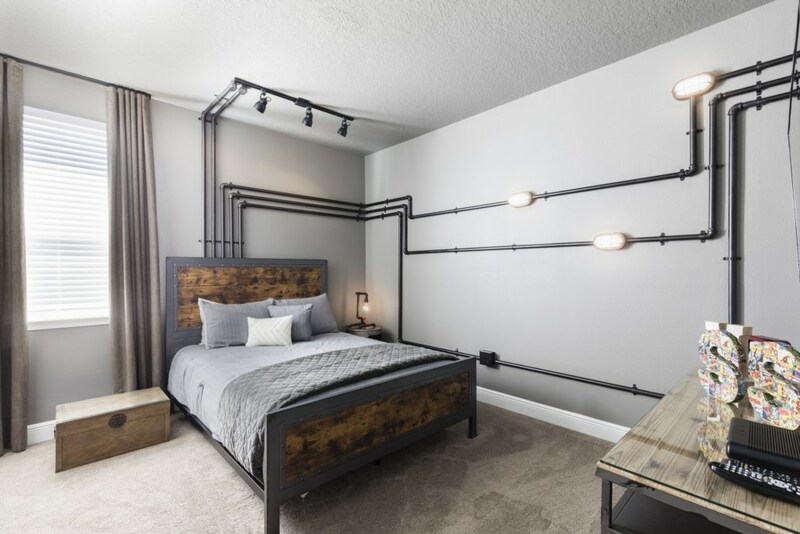 We love a well-designed interior and adore the contemporary meets industrial look at this villa. 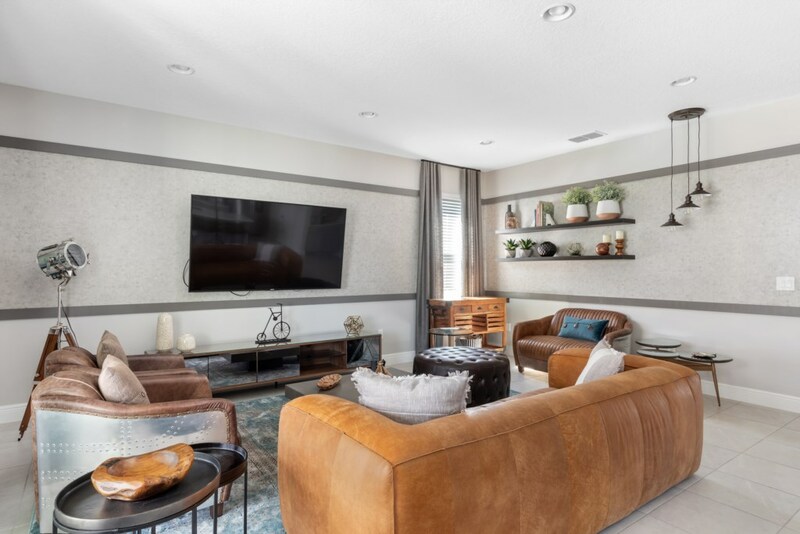 Open plan in design, the main living area features a tan leather sofa with three matching accent chairs centred around a wall-mounted, flat screen TV. 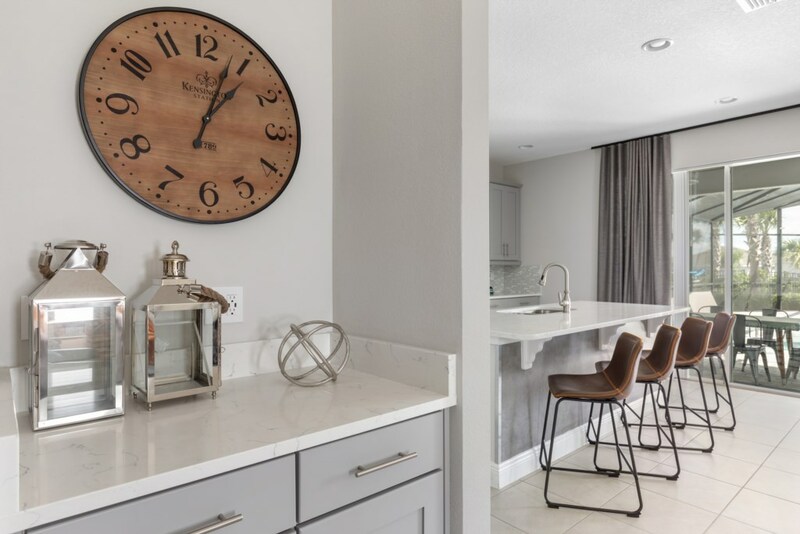 Both this area and the kitchen overlook the pool deck through floor to ceiling glass, sliding doors. 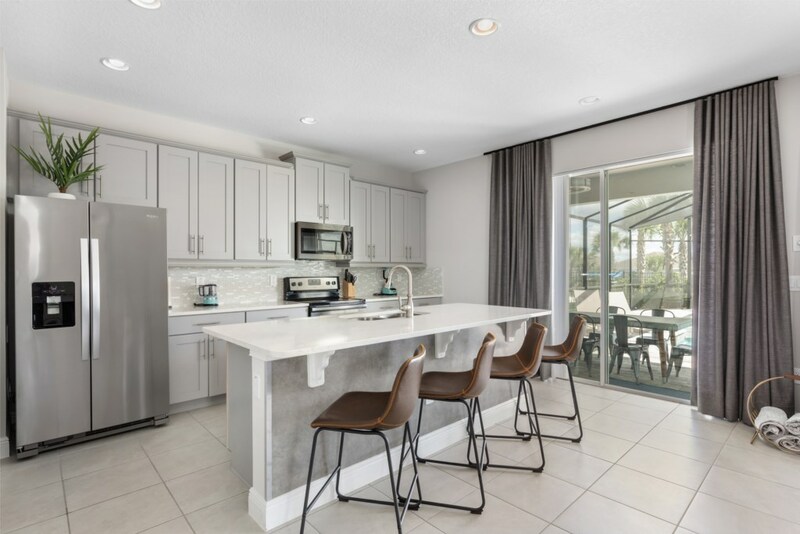 The modern kitchen comes fully equipped and has a four seat, island style breakfast bar. 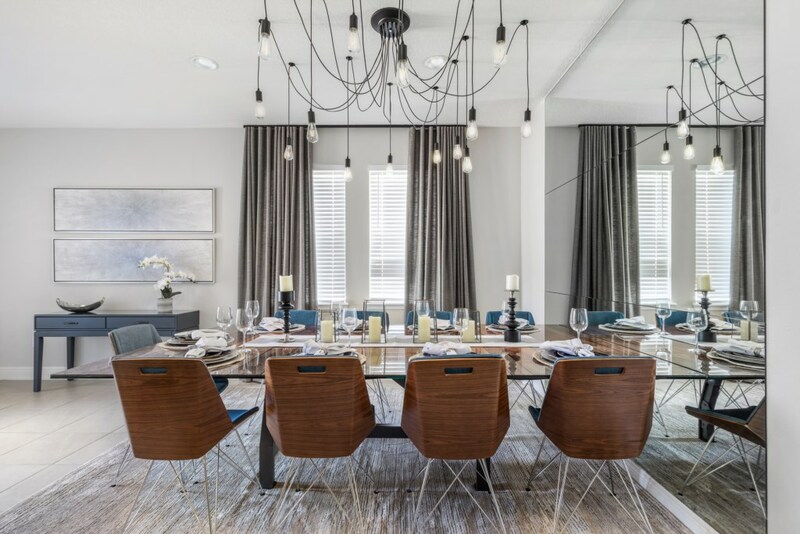 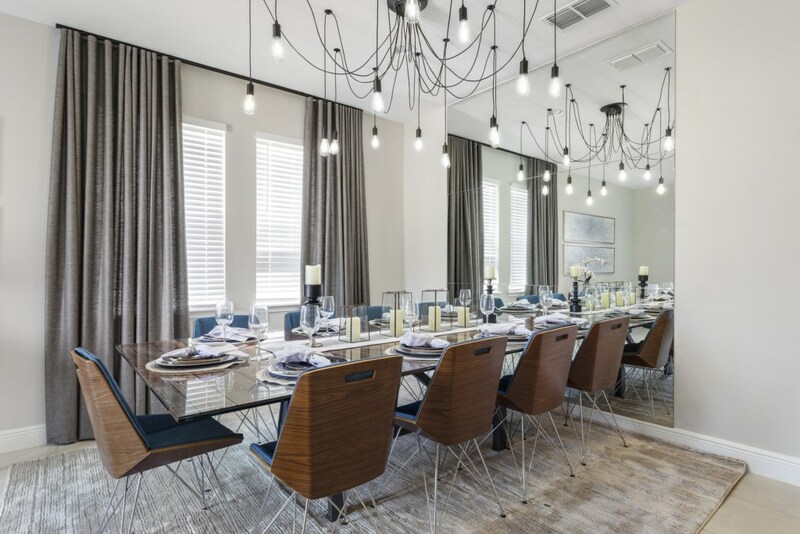 A glass topped dining table sits up to nine guests on contemporary chairs, a multi-pendant chandelier overhead. 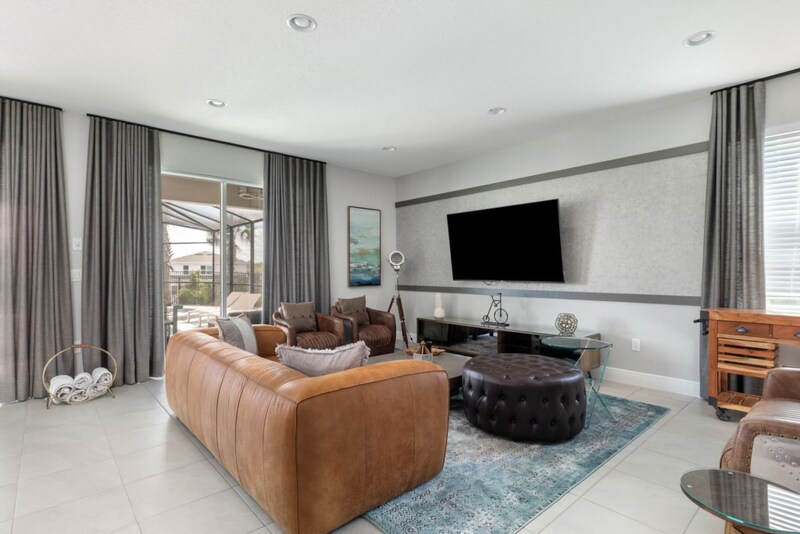 The property sleeps up to 11 guests over 6 bedrooms; each furnished with their own flat screen TVs and access to complimentary Wi-Fi. 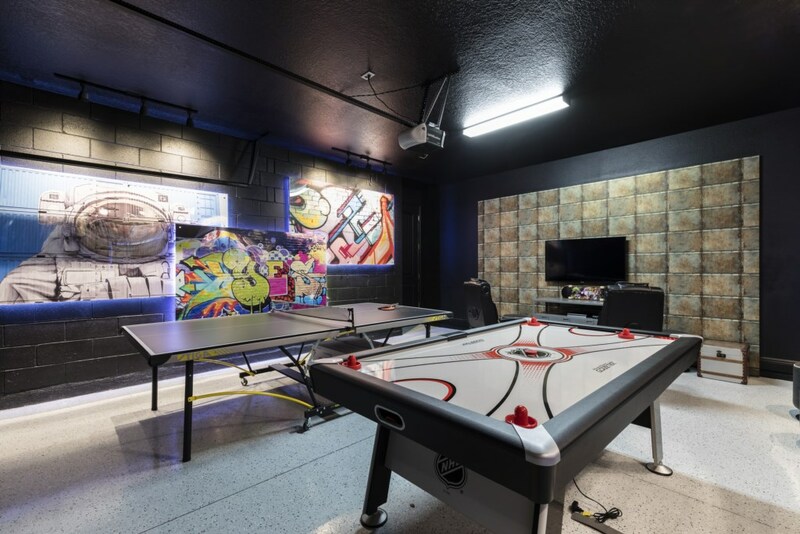 There’s also a really cool games room, decked out in black with graffiti murals on the walls. 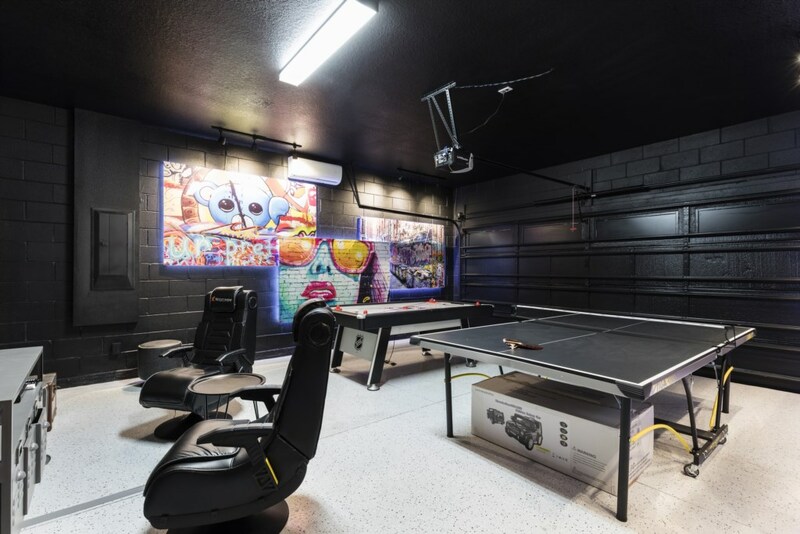 It as a large, flat screen TV with PS4 games console and two gaming chairs, plus air hockey and ping pong tables. 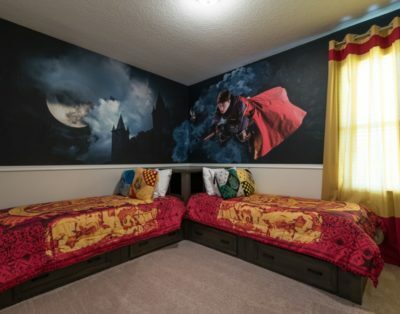 Enough to keep the entire family amused! 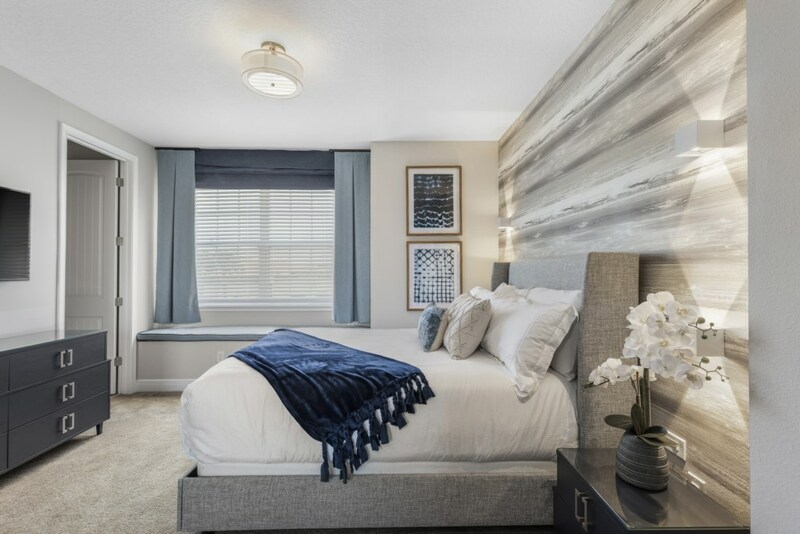 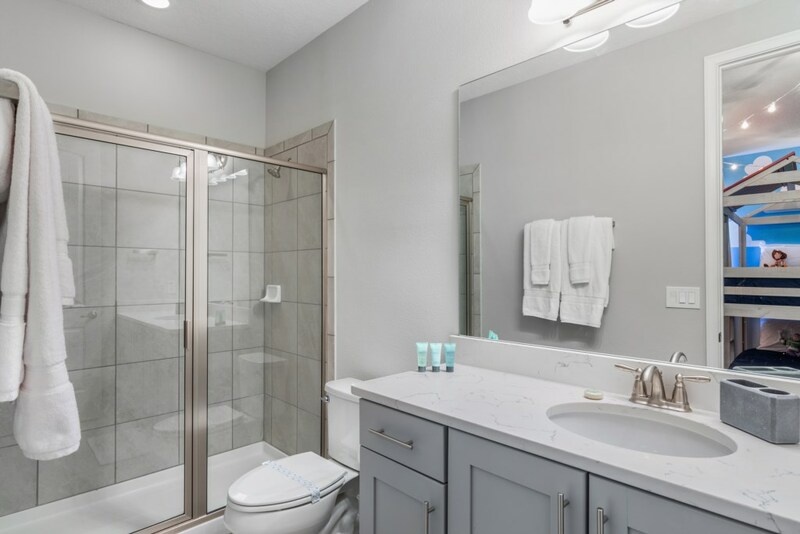 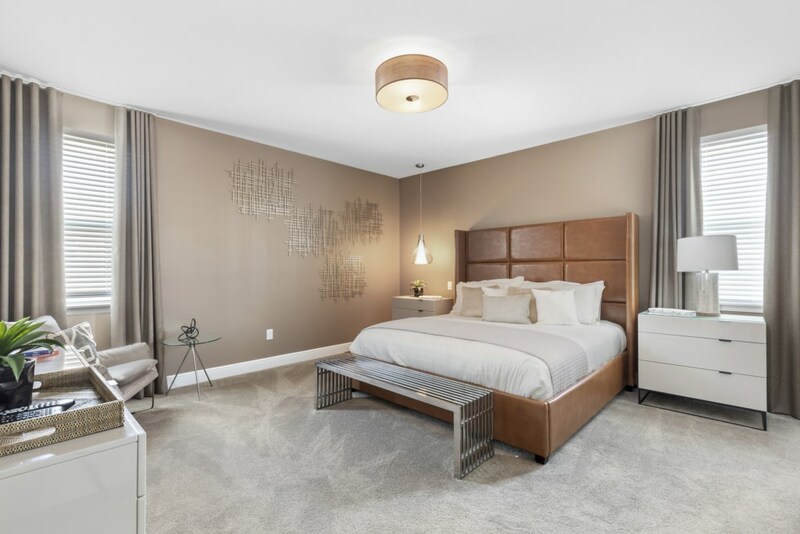 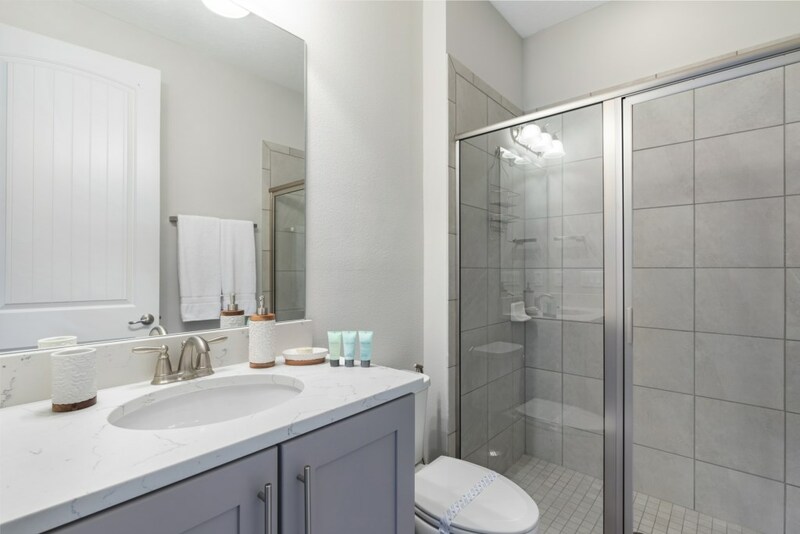 All individually designed, there is one queen sized bedroom with access to a family bathroom with shower downstairs and the remaining five bedrooms upstairs. 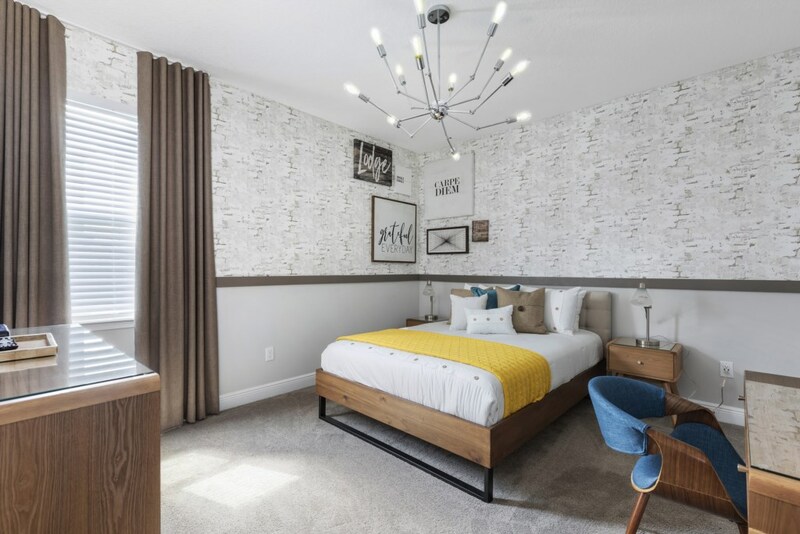 If you have a teenager who wants some space or an older relative who wants to forego stairs, this bedroom fits the bill. 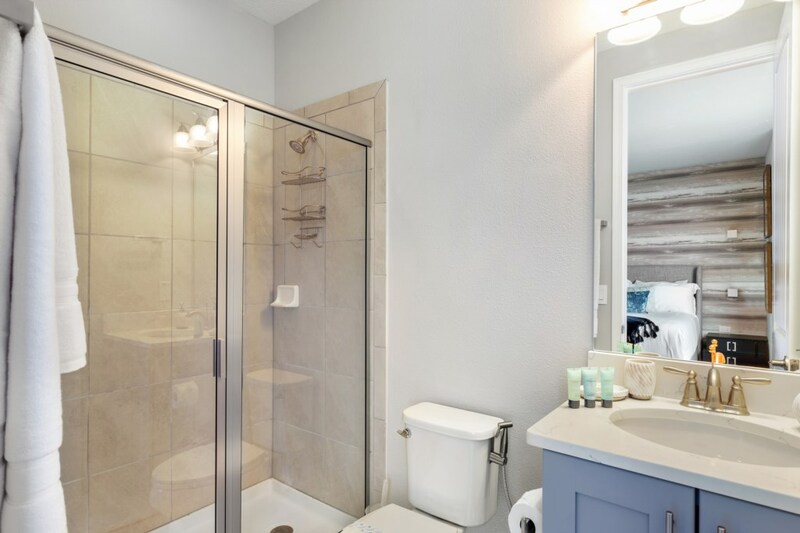 Upstairs there is a king sized master suite with ensuite shower, tub and vanities, two queen sized bedrooms, both with ensuite showers, and two children’s themed bedrooms. 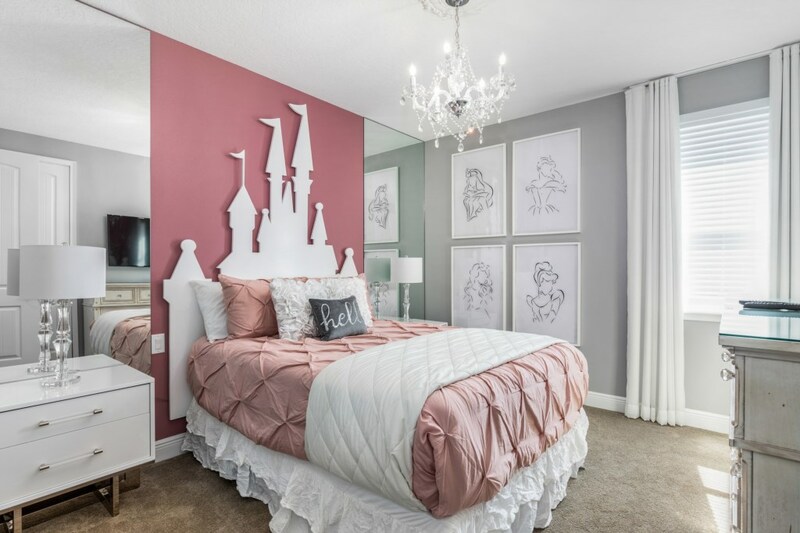 An elegant ‘Princess’ themed bedroom features a full sized bed with castle silhouette headboard, a dusky pink, frilly duvet and monochrome princess illustrations adorning the walls. 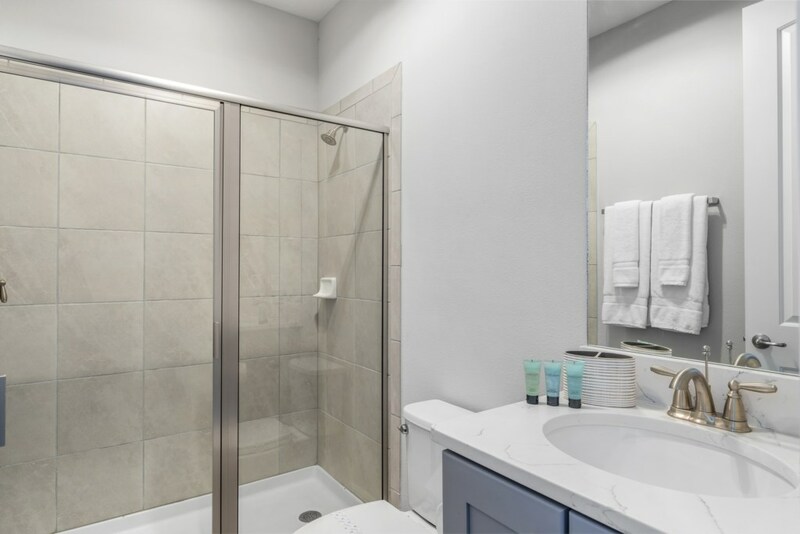 This room has an ensuite shower. 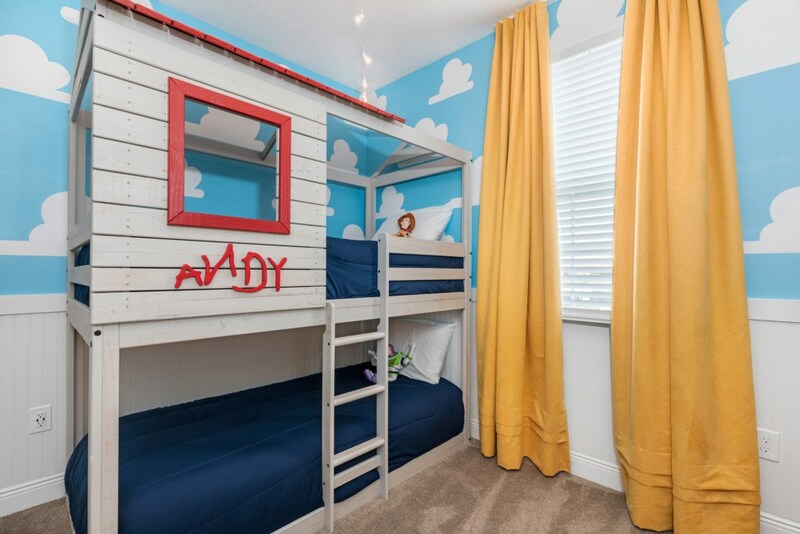 The second kids themed bedroom is a ‘Toy Story’ wonderland, with tree house style, twin sized bunks and cartoon cloud walls. 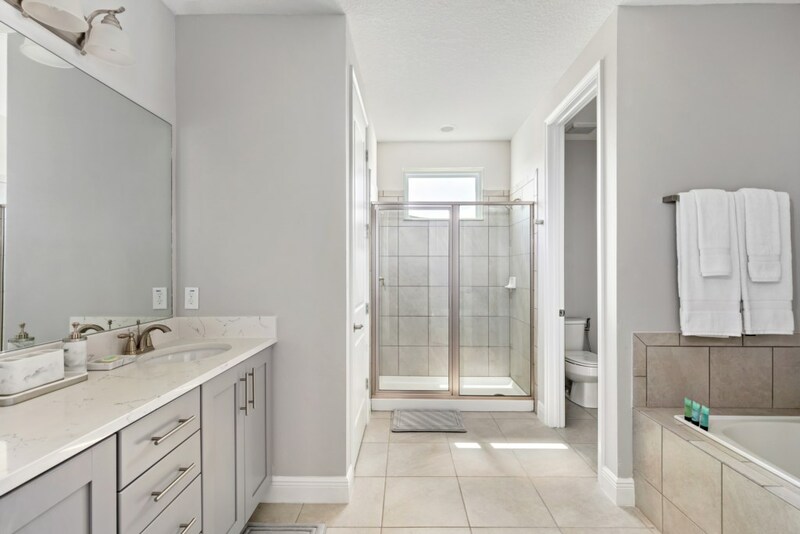 This room has an ensuite shower too. 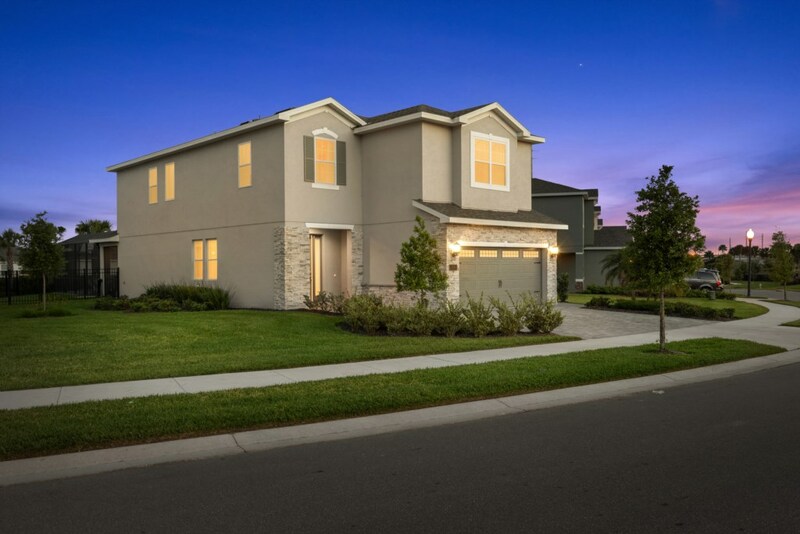 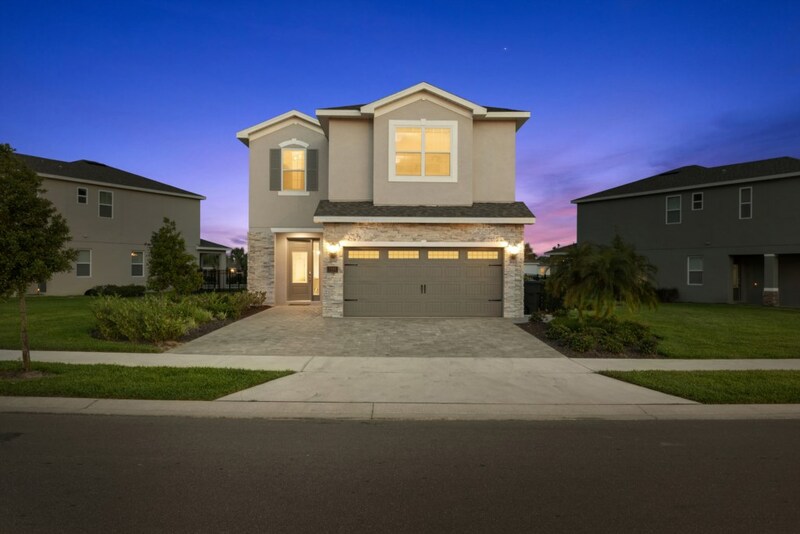 This is slick, city living in the tropics and with all the luxury additions, it’s got to top the list for six bedrooms in Orlando!